Once called the toughest, rawest, most hard-boiled little hellhole that ever passed for a civilized town, Panamint City got its start after several bandits, who were using the area as a hide-out, discovered silver in Surprise Canyon in 1872. While hiding from authorities, stagecoach robbers, William L. Kennedy, Robert L. Stewart, and Richard C. Jacobs were searching for the Lost Gunsight Mine and doing a little prospecting, when the lucky outlaws discovered promising deposits of silver ore in Surprise Canyon. Obviously, the men wanted to profit from their find, but, there was the ‘little” complication of them being “wanted” for stealing $12,000 from a Wells Fargo stage. Hatching a “plan,” they soon went to Nevada Senator, John P. Jones, who had long been involved in the mining industry, with rich ore samples. If the senator could take care of their little criminal “problem,” they would agree to sell him their claim. Jones along with his colleague Senator William M. Stewart, also of Nevada, soon made the arrangements to grant amnesty for the bandit mine owners, but only after making sure that the stolen $12,000 was repaid from their profits. Senators Jones and Stewart, known as the “Silver Senators” for their wide range of mining investments, soon organized the Panamint Mining Company with a capital stock of two million dollars. With word out about the silver found in the area, hundreds of prospectors flooded the region and the Panamint Mining District was formed in February 1873. Arriving with wagonloads of tools and provisions, prospectors soon found several lodes including the Wide West, Gold Hill, Wonder, Wyoming, Pine Tree, and dozens of others. While this resident’s positive outlook may have been reflected by some in the camp, Panamint City was seen by most as a rough and lawless place, with over fifty shootings occurring during its short life. By 1874, the town boasted a population of about 2,000 people and its 1 ½ mile-long rutted and muddy main street was lined with about 50 buildings, which included not only more than a dozen saloons, but also the Bank of Panamint, a brewery, a hotel, the post office, and the offices of the Panamint News, which printed its first issue in November. The town also consisted of about 200 houses, many of which were no more than log and rock huts. Others made their homes in simple tents. The local butcher shop’s wagon also served as the town hearse which made frequent trips to a cemetery located a short distance up Sour Dough Canyon. By August 1874 a road had been completed through Panamint Valley and up Surprise Canyon, providing contact with Los Angeles for freighting and supply purposes. Two stage lines also opened service to Panamint in November 1874. One of the town’s many saloons – the Oriental – was billed as “the finest on the coast outside of San Francisco.” Interestingly, Wells Fargo refused to open an Express office in Panamint, probably because of the deal that the senators had made with the bandits. In the meantime, Senators Jones and Stewart were buying up more properties in the area including mining claims, a stamp mill, and the Surprise Canyon Toll Road. 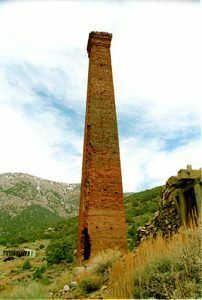 In June 1875, their Surprise Valley Mill and Water Company opened a twenty-stamp mill, which soon shipped ore averaging $80 to $100 per ton from the Panamint mines to the west coast and Europe. Like Cerro Gordo, some 50 miles distant, the Panamint silver veins were exhausted much sooner than anyone expected. In August 1875, when William Ralston’s Bank of California failed, just days after the Surprise Valley Mill and Water Company had opened its 20-stamp mill, it shattered the confidence of investors. T. S. Harris published his last issue of the Panamint News on October 21, 1875, and left for Darwin, California. That same year, hundreds of residents left the town as rumors circulated that the ore was nearly exhausted. 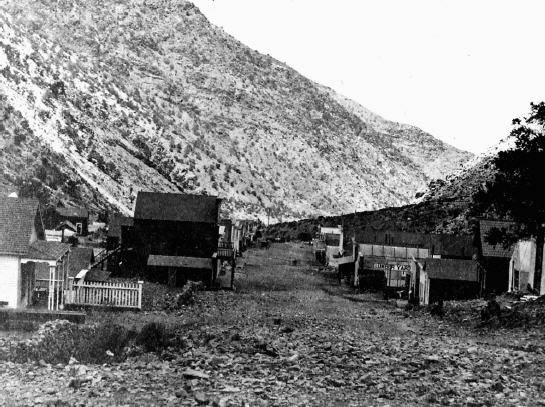 By 1876, two of the major mines in the area were depleted and the same year, a flash flood roared down the canyon, washing away much of the town. The last to give up were the “Silver Senators,” themselves. However, after a serious stock market panic in May 1877, the Panamint mill also closed, as well as the post office. Mining in the area continued on a sporadic basis for years. Panamint’s post office reopened from 1882 to 1883, and again from 1887 to 1895. 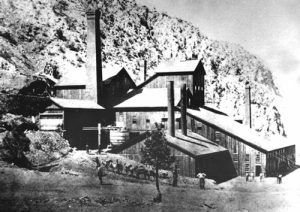 The Panamint mines continued to be worked off and on until 1926. Another revival occurred briefly in 1946 when the American Silver Corporation leased 12 patented claims, 4 patented mill sites, and 42 unpatented claims. The company built a camp at Panamint and improved the Surprise Canyon road. Most of the work was concentrated on the Marvel and Hemlock claims, but no ore was reported being shipped. The American Silver Corporation filed for bankruptcy on March 22, 1948. Today, all that’s left of the once flourishing community are a few foundations and the crumbling smokestack of Surprise Valley Mill and Water Company that was constructed in 1875. Inyo County continued to maintain the road to Panamint City until about 1983 when a series of cloudbursts completely washed out the road. However, dedicated 4×4’s could still travel along the travel along the path until it was permanently closed in 2001 by a lawsuit brought by an environmental group. Today, the ruins of Panamint City, which became part of the Death Valley National Park in 1994, are only accessible via a five-mile strenuous hike from Chris Wicht’s Camp, which is located six miles northeast of the ghost town of Ballarat.